Breaking new Diabetes ground isn't that hard. You just have to show up, strap in, and figure out when to take your pump off. "Crap," I thought. "I drove all the way down here, listened to this hour-long brief, just to get told at the last minute that I can't participate. Great." We headed up to the Colonel's office, I was embarrassed to be such a pain. When we stepped in his office, he was excited! Yes, you read that right, excited! The doc with me explained the situation and the Colonel together with a by standing Major talked through a scenario that we all agreed would work. 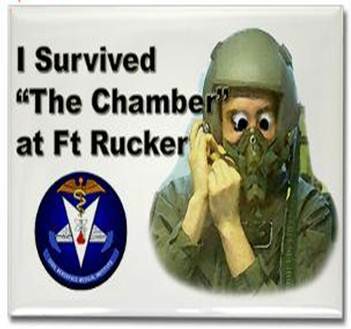 The Colonel mentioned that to his knowledge I was the first Type 1 Diabetic to ever go through their chamber. He then proceeded to explain how he never gets to work on "medical challenges" anymore, he even told the doc that they should write it up in the Army Aeromedical Journal following the chamber flight. I honestly have never seen three doctors so excited about my Diabetes! Usually they are trying anything in their power to ground me, but not today! So, I strapped in, pump and all and completed my 30 minutes of de-nitrogen in the chamber's "lock" area [similar to an air lock]. After that I took the pump off [only being insulin-less for approximately 20 minutes] took one big breath, unhooked my oxygen supply, held my breath and ran to my actual "chamber " seat. The men helping us inside the chamber made sure I was re-hooked and that was it. I was back to being just one of the guys [turns out I was the only girl, big surprise]. After the flight was over I reattached 'le pump and headed to the debrief [by the way, my hypoxia symptoms are euphoria, denial and hot/cold flashes in case anyone happens to be on a plane with me during a decompression!]. In my opinion, every little bit counts, even somewhat trivial procedures to allow a Type 1 Diabetic to experience the altitude chamber. We are getting there. Slowly but surely.